Research Skills Training Materials are designed to teach staff how to be more effective researchers. Confidently train the basics of research, planning a research strategy, how to document sources and more! Seeing is Believing This sample manual to teach Research Skills is in MS Word format. Expanding your research skills is important when it comes to maintaining your credibility and giving great reports. With the amount of ways information can now be accessed, it's more important than ever to have a research strategy in place to ensure your information is accurate, up to date, and relevant. 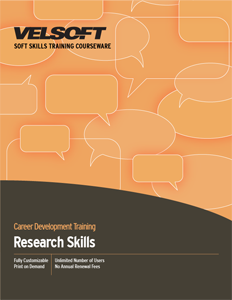 Velsoft Research Skills Training Material makes teaching research methodology a breeze. Whether you want to teach academic or business research skills, students will learn how to find the information they need, track their sources, determine how valid information they come across is, note-taking techniques, and more. Students coming to you looking for effective research skills learning will benefit from these up-to-date training materials, which includes content on online research, library skills, and more! All training material is fully customizable, print-on-demand, and includes an instructor's guide, student manual, research skills PowerPoint material, activities, and more, for a comprehensive one-day workshop. Trainers can also consider combining their teaching material with eLearning, an online, blended learning opportunity that turns research skills learning into an interactive and independent experience. Want to see the topics you will cover in this course? Check out the Research Skills Course Outline.